It was all hands on deck Friday in Lawrence where families returned to check in and allow gas workers inside for testing. As homeowners took in the damage, the cleanup is just beginning. 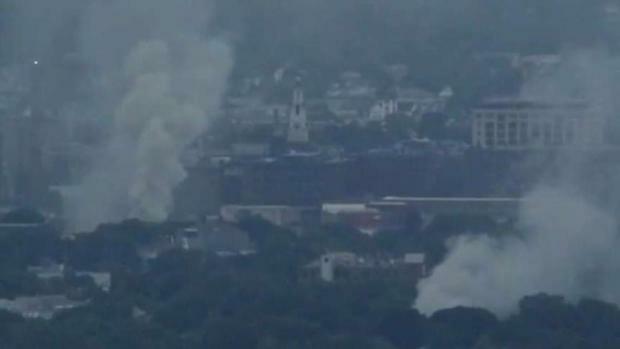 Massachusetts Attorney General Maura Healey is offering advice and resources to Merrimack Valley residents coping with the aftermath of the gas-related explosions. The Friday news release includes information for homeowners, renters, and ways for people to make charitable contributions to the victims. Massachusetts Gov. Charlie Baker declared a State of Emergency for the Merrimack Valley due to his dissatisfaction with the way Columbia Gas has handled a series of natural gas explosions on Thursday. • If your home has been damaged or destroyed, it is important that you make a list as soon as possible of valuable items in your home (furniture, jewelry, electronics, cash, etc.). This will help complete claims paperwork later. • Keep all receipts for any money you spend related to this emergency, such as hotel bills, monies paid to hospitals, replacement clothing or baby supplies, etc. • If possible, document any damage with pictures or videos and do not dispose of any damaged items unless instructed otherwise. • Use reasonable means to save and preserve property that has not already been destroyed. For example, if possible, board or tarp open areas exposed to the elements to prevent water damage. • Public adjusters may attempt to contact you and offer to handle your insurance claim on your behalf. Public adjusters are supposed to act as your representative in dealing with an insurance company in exchange for a percentage of your insurance settlement. There is no requirement that you hire a public adjuster to handle your claim, but if you decide to enter into an agreement with a public adjuster, please read the contract carefully before signing it. • Many renters in the region may be unable to safely occupy their homes for days or weeks, depending upon the extent of the damage. Some housing may be permanently uninhabitable. • Renters should contact their landlord and notify them in writing about the extent of damage to rental units. • Residents may want to document damage with photographs from their unit, if the unit can be entered safely. • If units are uninhabitable, renters should discuss alternate housing that the landlord can provide or withholding rent while the renter finds other housing. • Renters should review the terms of their leases to hold informed conversations. • All rental housing in Massachusetts must meet state standards for health and safety. • Never give to a charity you know nothing about. Well-established charities with experience in disaster relief, community foundations, or organizations established with support from government agencies are generally a good choice. One example is the Lawrence Emergency Fund of the Essex County Community Foundation. • If you are contributing over the internet, make sure that the website you are visiting belongs to a legitimate and established charity. • Most crowdfunding sites are not charities and many typically take a percentage of your donation as a fee. • Ask lots of questions. How much of the money goes to the charity and how much to a professional fundraiser? Ask if your contribution is tax deductible and what the charity intends to do with any excess contributions that might remain after the victims’ needs are addressed. • Beware of social media posts or emails soliciting donations to copycat organizations or fake websites. • Do not give your personal or financial information to anyone soliciting money. • Never pay by cash. Pay by check or credit card and make a check out directly to the charity, not the fundraiser or any other individual. Specify, on the check and in writing, whenever possible, the purpose of your donation. • Visit the Donating to a Charity page on the AG’s website.